Men’s Coffee Hour: Wednesday April 24, 2019 from 10—11 am Balsdon Hall. Many thanks to all who volunteered to make this event a success! We had 33 card tables this year. Many people commented on the amazing food and it’s presentation, beautiful decorations and draw prizes. Congratulations to the decor team, ticket sellers, set-up team, coffee servers, sandwich and cookie makers, plate makers, dishwashers and furniture movers … you all did a great job! Well done! We raised $2,950 for St Bartholomew’s United Church. 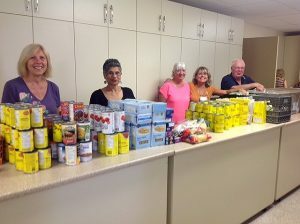 On April 4th 13 volunteers had a busy, very productive sorting day. We prepared 5 boxes of shoes, 7 bins & 13 bags for Regen, 25 bags for Scott Mission, 7 for Peel District School Board’s We Welcome the World, 4 bags for Sierra Leone & 1 for Brampton Animal Services. We were blessed with comforters and sheets to partially fill the wishlists of two families – one with 7 children, the other with 3 children. We also set aside clothing for one Mom & 3 children. Requests for additional comforters & sheets remain for two families. We’re taking a break so our next sort will be Apr. 25th. Please mark your calendars. It will be BIG one!! All hands on deck for that one!! 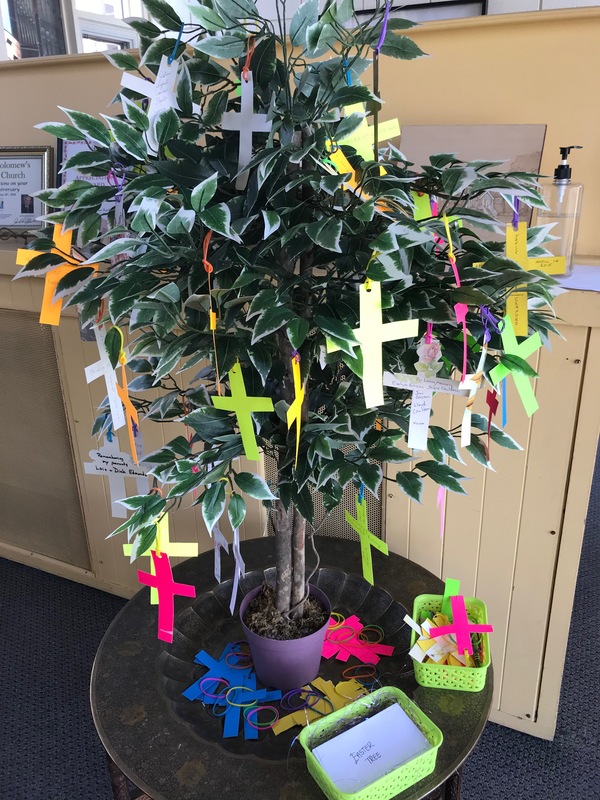 As is our long time tradition, Outreach welcomes you to hang a cross on our Easter Tree – in thanks for someone who is important in your life right now or as an “in memoriam”. Funds collected will be used for Outreach projects and activities. 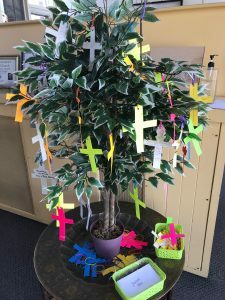 In April we are collecting for St Andrews Presbyterian’s Wednesday program. Their wish list includes anything for babies especially formula and diapers as well as canned foods including: tuna, peanut butter, potatoes, stews, and chunky soups. They also give out soap, laundry detergent and toilet paper. If you would prefer to provide a monetary donation, (and thus receive a tax receipt through St Barts) you may make cheques out to St Bartholomew’s United Church and note on the bottom of the cheque that it is for St Andrews’ Food Bank. They often buy fresh meat such as chicken legs to distribute – a huge treat for their clients. We have received our assessment for 2019 from the United Church Head Office for central operating expenses. Under the new organizational structure of the United Church, this replaces the former Presbytery and Conference assessment, which was largely based on the number of members in our con-gregation. A new approach for allocating central operating expenses is based on the level of revenues of each congregation. 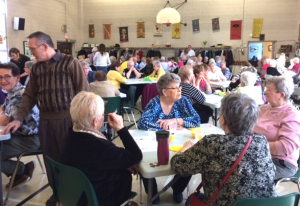 The approach is consistent across all congregations of The United Church of Canada. For 2019, we have set the individual assessment in our congregation at $45 per person. Please remit your assessment and mark your envelope – “UC Assessment”. Thank you in advance. Terry Gabel – Treasurer. 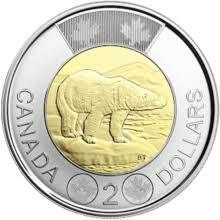 There is a container in Balsdon Hall to accept your Loonies, Toonies and loose change toward our Toonie Challenge for 2019. Envelopes are available for larger donations in order to receive credit on your 2019 donation receipt for income tax purposes. Thank you so much for our overflowing basket. Barb reports that the residents continue to really enjoy the opportunity to have magazines to read. 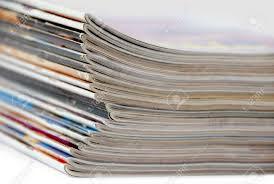 Please continue to bring in magazines of various types: relating to fashion, gossip, food, sports, cars etc. & deposit them in the box in the sanctuary – next to the food bank. This initiative will be ongoing in 2019. The Clothing Room at Regen contin-ues to need plastic bags for guests to carry out the clothing chosen. Please bring any plastic grocery bags you may have and place on the Balsdon Hall stage – labeling them “Regen bags”. It would be VERY helpful if individual bags were folded before placing them in a single bag for delivery to us. Thank you soooo much for the recent bags that have been donated. This continues to be a high priority need. 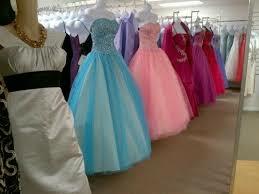 Clothing for Prom – All items must be here by May 1st. For the second year in a row, Inside the Dream, the charity that provided prom/grad clothing for teens living in poverty, has canceled its Boutique Day. Like last year, St Barts will initiate its back up mini version… Our liaison from Peel District School Board will invite school social workers to come here one morning to pick up items we have saved. We’re hoping we’ll be able to help. 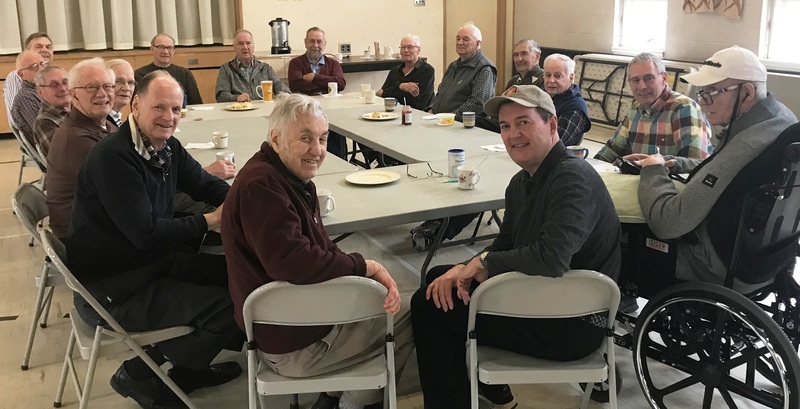 Given the ongoing strong turnout at their weekly meeting, the Men’s Club covered the full cost of the squares that were served at lunch at the Card Party fundraiser. The Men’s Club meets every Wednesday morning at 10 am in Balsdon Hall for an hour of coffee, cookies and fellowship. This past week, the Men’s Club was treated to to homemade scones courtesy of Eunice Whittaker!! Thank you Eunice! !